@theavettbrosRehearsal for #CMTcrossroads with our friend @randytravis. The Avett Brothers and country legend Randy Travis will star in a new episode of CMT Crossroads, premiering Friday (Nov. 23) at 11 p.m. ET/PT on CMT. Randy Travis didn't kick the holy crap out of anyone outside of a Texas church back in August ... at least that's what the country singer is telling the judge. Travis just appeared in court in Plano, Texas ... where he plead not guilty to simple assault for allegedly attacking another man in the church parking lot around 1 AM on August 24. TMZ broke the story ... cops say Randy was the primary aggressor after getting involved in a "family argument" between a woman and another man. Randy's lawyer, Larry Friedman, had told us the woman is Randy's fiancee ... who was arguing with her estranged husband ... when Randy entered the situation. Friedman claimed Randy had simply "come to the rescue" and did nothing wrong. The case is now slated to head to trial -- which is set to begin in March. 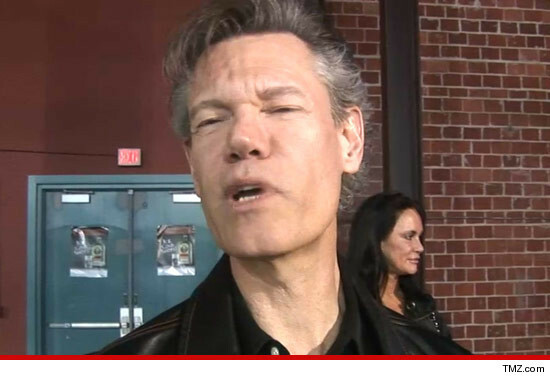 Country music star Randy Travis pleaded not guilty to an assault charge. Police say Travis got into a fight with another man at Prestonwood Baptist Church in August. He was not arrested, but given a citation for a five hundred dollar fine. Travis says he was only protecting himself, and his girlfriend, when her estranged husband attacked them in the parking lot. Travis' trial is set to start in mid March. Randy Travis was in court in Plano today, pleading not guilty to assault following that August dust-up in the Prestonwood Baptist Church parking lot. The case is set for trial March 11. Travis, you may recall, wasn’t arrested at the time, but issued a citation for Class C simple assault. His attorneys, Pete Schulte and Larry Friedman, say they’re anxiously awaiting March 11 — if nothing else, to clear their client’s name and prove what really happened the night of August 23. At the time of the incident, Plano police said that officers at the scene “determined there had been an argument between an estranged husband and wife.” That woman, turns out, is Travis’ girlfriend. Friedman says today that there were actually two men involved, and that they were harassing the woman and her 17-year-old daughter. And despite earlier accounts that said Travis was drunk, police said there was nothing to indicate he’d been drinking alcohol. Just weeks earlier Travis had been arrested and charged with driving while intoxicated up in Pilot Point following a similar incident in Sanger. But Friedman says Travis is now clean and sober. The country superstar is finally facing the music over last August's infamous naked arrest now that prosecutors in Sherman, Texas have filed a DWI charge against him. Travis' attorney, Larry Friedman, confirmed to E! News that the 53-year-old singer was charged with one count of driving while intoxicated after he was found in toxicology tests to have a blood-alcohol content greater than 0.15 (the Lone Star State's legal limit is 0.08). This after police say Travis crashed his car on Aug. 7, 2012, and was found lying in the road naked and reeking of booze. After spending a night in the clink, the musician was released after authorities lent him some scrubs and a baseball cap (though no shoes). The DWI count is punishable by a maximum two-year jail sentence and a $4,000 fine. A separate possible charge of felony retaliation, for allegedly threatening his arresting officers, remains under investigation. A local CBS station quoted Grayson County DA as saying: "The case has taken some time because of blood tests that have been completed by both the prosecution and the defense." Brown added that both sides were working on negotiating a possible plea deal to resolve the matter quickly. No word yet on the next court date, but here's hoping he's got the wind at his back. The DWI isn't the crooner's only run-in with the law. Last month, Travis pleaded not guilty to a charge of simple assault resulting from a row he got into outside a church with a man after he waded into an argument the estranged husband was having with his wife, who's a friend of the Grammy winner. Days before Christmas, Randy Travis was in Collin County court pleading not guilty to assault following the Aug. 23 dust-up in the Prestonwood Baptist Church parking lot. Long story short, for those who’ve forgotten, the country singer got into it with Ritchie Beougher, the estranged husband of Travis’s fiancée Mary Beougher, and Mary’s brother, William Barnes Davis. Travis’ attorney, Larry Friedman, has always claimed his client was a “knight in shining armor” who got involved only after the pair began accosting Mary and her 17-year-old daughter Cavanaugh. DALLAS - Country music singer Randy Travis has reached a plea agreement in a misdemeanor assault case arising from an altercation last summer in a Texas church parking lot, KTVT-TV reported on Saturday. The Grammy winner will serve 90 days of deferred adjudication under a plea he entered on Friday in a municipal court in Plano, a Dallas suburb, the CBS-affiliated station in Dallas/Forth Worth reported. SHERMAN (January 31, 2013)—Country singer Randy Travis, 53, pleaded guilty Thursday to driving while intoxicated in an incident last summer in which the naked country music star crashed his Pontiac Trans Am north of Dallas. Travis received a 180-day suspended jail sentence, 24 months of probation and a $2,000 fine. He could have received as much as two years in jail and been fined as much as $4,000. Investigators say Travis was naked and combative at the scene and had a blood alcohol level of more than 0.15. The legal limit is 0.08. Randy Travis has been sentenced to 180 days in jail in connection with his naked DWI arrest last August in Texas, but he probably won’t serve any time behind bars. Instead, Travis struck a deal for two years probation, 30 days in a rehab facility and 100 hours of community service. Should Travis violate his probation, authorities could haul him in to serve the full 180 days behind bars. Travis has also been ordered to install an ignition interlock device on any car he drives for the next two years. Country music star Randy Travis has sued the Texas Department of Public Safety and the Office of the Attorney General after some evidence from his drunken-driving arrest last summer was ordered released to the public. Travis in January pleaded guilty to driving while intoxicated. The arrest video was collected Aug. 7 after Travis was found naked after crashing his Pontiac Trans Am near Tioga, a town where Travis lives that is about 60 miles north of Dallas. He received two years probation, a $2,000 fine and a 180-day suspended jail sentence, and the judge presiding over the case ordered Travis to spend at least 30 days at an alcohol treatment facility, complete 100 hours of community service and have an ignition interlock device on any vehicle he operates while on probation. The judge also agreed with a defense motion asking that the arrest video and transcript not be released to the public. The judge also issued a ruling ordering the destruction of the video, saying that it may not be released, Travis says in a lawsuit filed with the Travis County district clerk on Tuesday. However, the attorney general issued a ruling earlier this month saying that some of the information should be released under a public information act request, the suit says. DPS received a written request for information about the arrest and sought a ruling from the attorney general, the suit says. Agencies often request such rulings from the attorney general’s office after receiving public information requests. On May 3, the attorney general ruled that a portion of the information must be withheld and the remainder should be released to the requestor, the letter says. The lawsuit doesn’t specify which information the attorney general said should be withheld and which should be released. According to the suit filed Tuesday, the singer is seeking $100,000 and a declaratory judgment that information about his arrest not be released under a public information act request. A judge originally granted a defense request to block the video from being released. But media groups requested the video from DPS, and the attorney general's office ruled this month that the judge didn't have discretion to bar the video's release. Thank-you for bringing the original article to our attention. I was thinking along the same lines as you are seahorse. Page created in 2.188 seconds with 21 queries.